As a committed landscape photographer, I am finding that I am becoming more obsessed with visual preconceptions. Twice in the last year, I have come away from a landscape shoot dissatisfied with my results simply because it had not materialised the way I had planned: the sky was just not interesting enough, or there was a lack of any foreground detail to frame the shot. On both occasions, after I had uploaded the images, I was pleasantly surprised to find that I had captured a momentary scene which oozed atmosphere and emotion. 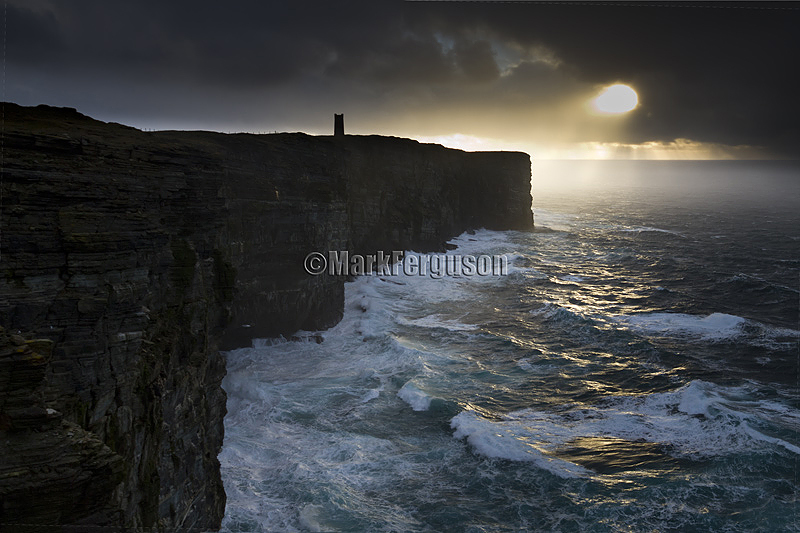 I took this image at Marwick Head on one of these occasions. I remember that I had left Marwick Head disappointed at not having captured the anticipated sunset-glow on its impressive cliffs, only to discover later that I had taken a completely different type of image, one which portrayed a fleeting moment in time, and which could never be planned for. This is the beauty of winter landscape photography in Orkney, namely the unpredictability of the weather conditions and hence the light. While it is satisfying to execute a pre-planned shoot successfully, I am finding that it pays off to be flexible in my choice of location and technique. So on this particular showery, typically windy, autumnal afternoon my intention was to capture the lovely sunset light on the wet cliffs at Marwick Head. I planned to use a combination of filters to enhance the blurred, ethereal effect on the sea, and for this I needed to use my tripod. On arrival, I soon abandoned this plan as it was just too windy, even for a tripod. I reconsidered my plan as I huddled next to a rock face, temporarily sheltered from the squally horizontal rain. Suddenly, as the storm moved east, I noticed that the low-angled sun in the southern sky was sending sparkling shafts of golden sunlight across the water just beyond the headland. Instinctively, I quickly selected a neutral density gradient filter, and edged out from the sheltered rock face to the exposed cliff edge. Risking a complete drenching of kit and soul, I excitedly fired off two successive exposures, not really paying any attention to composition or camera settings. In an instant the moment was gone, and so, drenched and cold, I packed up and headed home, disappointed with the session and bemoaning the Orkney weather once again. Only later that evening, after I had uploaded my small image collection, did it dawn on me that I had got a 'cracker', an image that I could never have anticipated. This was one of the best grab shots I had ever taken!